It’s a new year and only a few short months to the Spring Break season. Thousands of visitors will ascend on the Gulf Coast for a much needed break from work and school. One of our travelers recently booked her Spring Break vacation and out of curiosity, we asked her how she will spend her vacation. Deep sea fishing, beachfront lodging perks, and traditional Irish dining are just some of the incredible things she loves to do in Destin! Does this sound like a vacation itinerary you would entertain? Our family has traveled to Destin, FL for Spring Break almost every year for the past 5 years. Each time we go, it’s different since the kids (5 and 10) are getting older and we are able to try new adventures. Our budget for our vacation is slightly higher this year because of my husbands raise and holiday bonus. We were able to book a nicer property closer to the beach opposed to a hotel last year. We chose to stay at Sterling Shores in a 2 bedroom condo. The condo is close to the beach (a short walk) and it’s in a gated resort with many amenities. My husband and 10 year old son will enjoy boogey boarding at the beach while my younger son will hang out at the beach or pool. For a 5 day stay, we booked through TripShock for under $1,000 total. This included some freebies such as dolphin cruise tickets (We did this last year and had a blast) and a complimentary beach service. We plan on going to a few nice restaurants this year since the kids are older and appreciate better quality food. We are looking at checking out McGuires in Destin and of course Harbor Docks (our favorite) this year. Both have high ratings online so I’m sure we will be pleased! As far as attractions go, my husband and son are going to try a fishing charter for the first time. 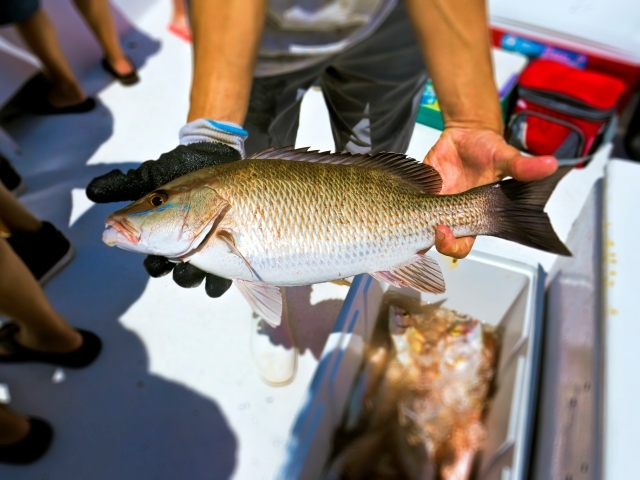 Since we don’t know a lot about deep sea fishing, we thought we would try the less expensive charters (party boat charters) since they are in our budget and offer a intro to the sport. If the boys like it, then we can always do something a little more serious during our next visit. We are also going to do some horseback riding since we love horses and always wanted to do it. They don’t ride on the beach, but that’s ok as we don’t mind riding in the forrest. We will spend most of our time laying out on the beach and just relaxing at the resort. We can’t wait for our vacation! Thank you Tripshock for making it so easy for us to plan.